At DeWitt, the Wapsipinicon River was half a foot below flood stage Tuesday morning, and the National Weather Service now predicts it will reach 1.3 feet over flood stage by Wednesday morning. High water has closed at least two roads in northern Scott County adjacent to the Wapsi. The Rock River at Joslin is still well below flood stage, 3 1/2 feet below flood stage. But it's now forecast to reach flood stage Tuesday night, and crest on Thursday about 4 feet higher. 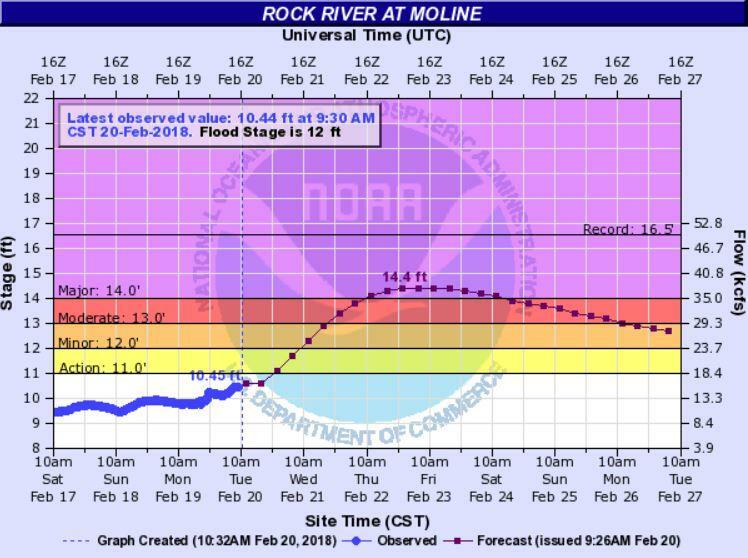 Downstream at Moline, the Rock is 1 1/2 feet below flood stage. It should rise to that level by Wednesday morning, then continue rising 2 1/2 feet more, and crest on Thursday afternoon or evening. The Mississippi River in the Quad Cities is also rising, but it's supposed to crest on Thursday morning more than 5 feet below flood stage.